Storage solutions come in all shapes and sizes and can help you solve a variety of organizational challenges! However, it is important to choose the right solution for your storage needs. After all, ultra-storage needs, calls for Ultra™ Totes! After you've spent all summer working on the yard, fall is the perfect time to organize and store away all of your outdoor supplies. This will make your life much easier when spring comes around and you are trying to find the gardening tools, potting soil or lawn decorations. Sterilite's line of durable Ultra™ Totes are available in three popular sizes, 10 Gallon, 18 Gallon and 25 Gallon for a wide range of needs. The deep recessed lids offer secure stacking capabilities for efficient use of vertical space, which is extremely helpful for storing those yard supplies in the shed or basement. 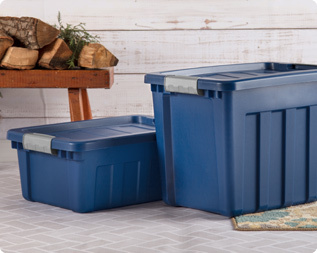 Additionally, the 10 and 18 Gallon Ultra™ Totes conveniently share a lid, which allows these shallow and deep totes to be stacked in the same footprint and optimize your storage space. The garage is great for storing hardware tools, painting supplies, and seasonal items throughout the year. The challenge with storage in the garage or even the shed are the cold winter temperatures. Our Ultra™ Totes are made of polyethylene and designed for cold weather storage. They are impact resistant so they can take a beating without breaking, even in very cold temperatures! Channeled walls provide added strength to the totes and help to resist crushing under heavier loads. With winter only a few short months away, start organizing the garage today! In many parts of the country it is common to have a wood burning fireplace. There is nothing better than watching Sunday afternoon football with great friends and good food in front of a warm fire. To avoid going outside each time you want to have a fire, Ultra™ Totes are perfect for storing and transporting your firewood. By securely keeping the firewood inside, it stays clean and dry for when you are ready to burn it. The heavy-duty latches on the Ultra™ Totes will keep the lid secured to the base and the integrated handles are designed for comfortable lifting and carrying. This will make transporting firewood a breeze this winter. Using Sterilite Ultra™ Totes for your most challenging storage needs will get you through the winter months, making you an Ultra Organizer! 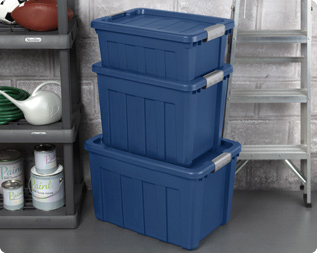 Optimize the limited storage space in your basement by taking advantage of the Ultra™ Totes superior stacking capabilities! 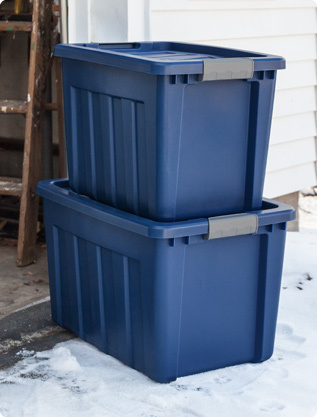 The polyethylene Ultra™ Totes are cold weather resistant making them the ideal storage solution for your garage! By keeping firewood on hand in the mudroom, it will stay dry and easy to access throughout the winter months!